With the refined look of linen, these elegant red linen weave paper covers will add a classic finish to any presentation. Our red linen weave covers are made from an 80lb cover stock with a linen finish. These red covers are perfect for use with any popular binding style (see list below), though we do offer these covers pre-punched (simply choose your preferred punching pattern in the drop-down menu above). Our window covers have a 1.75" x 4" window that is centered on the front cover 3" from the top edge. 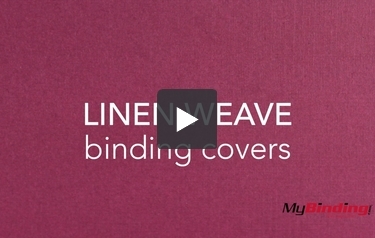 Take care in choosing the right cover for your needs as we offer close to 150 different colors and sizes of the linen weave variety. We have been using the linen covers, clear binding covers and plastic combs for over 10 years, when making our yearly calendars for our entire family, 27 at last count. Love the product, that's why we come back when our supply is low. Thanks!! The binding covers work great for our employee handbooks. We use them as the back cover with a clear sheet for the front. Great quality and the price seems reasonable too. Professional custom look Review by john z.